SPACIOUS second floor flat CONVENIENTLY LOCATED with GARAGE and communal PARKING, Offering SPACIOUS 16FT lounge, FITTED kitchen, 2 DOUBLE bedrooms and bathrooms. MUST BE VIEWED. EPC rating E.
The property is a spacious second floor flat conveniently situated within this popular neighbourhood, approached via a communal entrance and briefly comprising the following accommodation :- Entrance hall, spacious lounge (providing pleasant outlook), kitchen, inner hall, 2 double bedrooms, and bathroom. Outside is there is communal residents parking, and GARAGE in separate block. DG. VIEWING ESSENTIAL. EPC rating E.
Double cupboard, doors to kitchen and lounge/diner. Double glazed window, base units, rolled top work surface areas, double wall cupboard, single drainer sink with cupboard below, integral oven, 4 ring electric hob, plumbing for automatic washing machine. Having storage cupboardand doors to both bedrooms and bathroom. Double glazed window providing pleasant outlook, and electric heater. Double glazed window, and suite comprising :- Bath with shower over, pedestal wash handbasin, wc, and tiling to the walls. 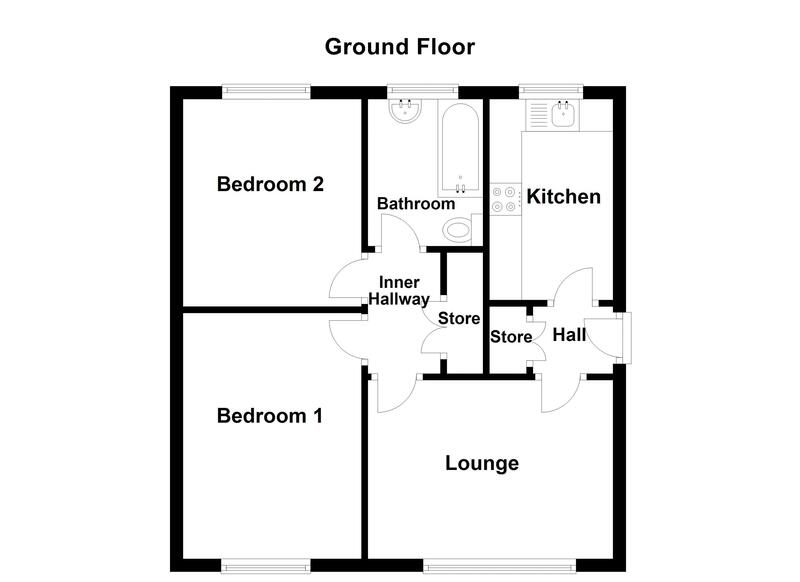 There is a garage allocated to the property in a separate block with an up and over door. Pleasant communal gardens and communal parking area. The agents are advised that the property is leasehold with approx 95 years left on the lease. There is a current ground rent of £87.50 pa. The vendors advise there is also a service charge of £410.00 payable every 6 months. The agents have not checked the legal documents to verify the status of the property. We therefore advise the buyers to satisfy themselves on the tenure.